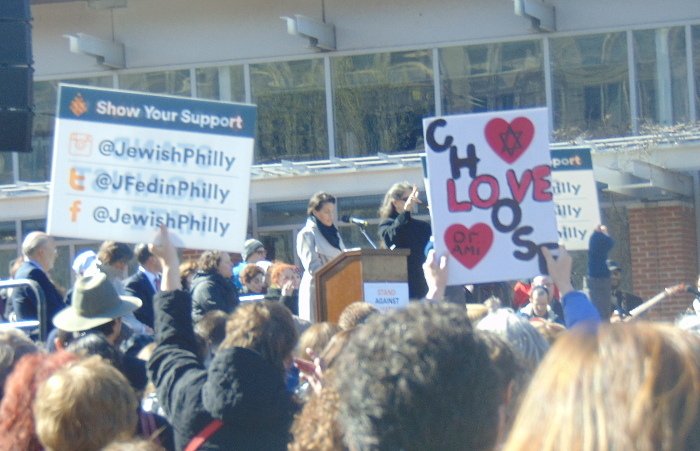 Gathering next to the Liberty Bell in downtown Philadelphia to demonstrate solidarity against the desecration of a Jewish cemetery. Thankfully, the travel ban enacted via an executive order and resulting in the revocation of 60,000 visas by President Trump has been dismantled by the courts as the Executive Branch was unable to show that it had anything to do with national security. Trump Administration complains that terrorist attacks have gone unreported, but puts out list of 78 attacks, many of which received very extensive coverage at the time. Two of the Trump women, Melania and Ivanka, reveal the utterly mercenary attitude of the Trump family. Melania sues The Daily Mail for a report that she says cost her a “once-in-a-lifetime” chance to profit off her high profile. Ivanka was distressed that her clothing line was doing poorly and both her father and spokesperson Kellyanne Conway advertised Ivanka's clothing, Conway doing so from the press briefing room with symbols of the room plainly visible behind her appeared to violate rules against profiting off of one's office. Conway was scolded. There apparently will be no further action taken. On Saturday night, while President Trump was entertaining Japanese Prime Minister Shinzo Abe, word arrived that North Korea had conducted a missile test. Trump and his people "turned his table into an al fresco situation room — astounded White House veterans, who were used to presidents retiring to private, secured settings to hash out such an event." CNN said: "President Donald Trump's senior policy adviser [Stephen Miller] on Sunday repeated Trump's unsubstantiated claims that people were bused from Massachusetts to New Hampshire to vote illegally in the swing state during the 2016 election." CNN ran a spot completely trashing Miller's claim. At a campaign rally (Yes, yes, the 2020 election is still a long way off), President Trump referred to a terrorist attack in Sweden. No one had any idea of what he might have been referring to. The alt-right has made many wild, fact-free claims about Sweden, so perhaps one of those claims were what Trump was referring to. Ivanka Trump gave people the impression that she was a liberal who defended the LGBTQ population. But when the Trump Administration decided they didn't want to prevent discrimination against trans-gender students, suddenly, Ivanka was nowhere to be found, not even in anonymous statements. From NPR (and the reason for today's rally): "Philadelphia police say approximately 100 headstones have been damaged at a Jewish cemetery in the northeastern part of the city." Film Clip from the rally. The Trump Administration attacks clean water rules. The World Health Organization explains why they're necessary. Slate tries to summarize everything that's been going on between the Trump Administration and Russia lately. It's a pretty extensive piece. Politico goes back to 2013 to detail just how Trump has related to officials there. Vox maps the connections between Trump and Russia.